Talking about subjects like the environment and climate change can be daunting. “The environment” encompasses so many issues, yet instilling our children with values such as standing up for environmental justice and living a sustainable life are crucial for future generations to be able to thrive. 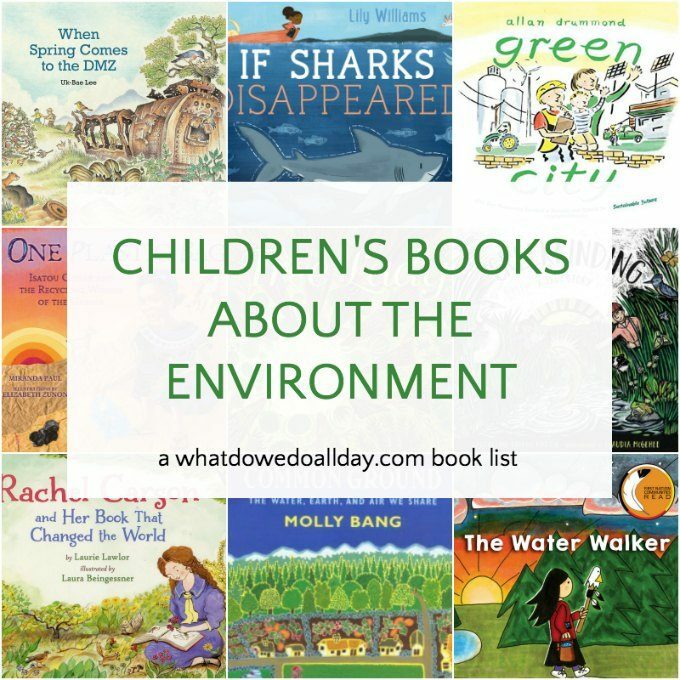 With these picture books about the environment and biographies of environmentalists you can approach a complex subject by focusing on more specific, narrow topics. While children read about sharks or learn about how an environmental activist planted trees, or become familiar with an isolated track of land in Korea, they will take home the message that Planet Earth is one awesome ecosystem worth fighting for. They may even be inspired to work for local environmental issues, restoration efforts, or take up a cause such as cutting down on plastic use or planting a native garden. When Spring Comes to the DMZ by Uk-Bae Lee. This gorgeously illustrated picture book introduces readers to a unique landscape with which most western children are not familiar. Uk-Bae Lee takes readers on a journey through the seasons in the demilitarized zone between North and South Korea, describing the abundance of flora and fauna that inhabit the landscape. Each season a grandfather climbs to a lookout point to observe the natural phenomena. At the end of the book the final pages show a gate and the pages fold out to display a wonderful landscape waiting to be explored. At several points in the story, the author reminds us that the DMZ is also a place where soldiers train and takes note of the barbed wire surrounding the area. A really wonderful book that will inspire a lot of conversations with your kids! The Water Walker by Joanne Robertson. Native American communities were the first to recognize what humans were doing to the planet and have always played a crucial role in raising awareness about the environment. Every morning an Ojibwe grandmother greets nibi (water) with gratitude. Knowing that unpolluted water will soon be a scarcity, she and a group of women start to walk around the Great Lakes in order to draw attention to the importance of clean water. It takes them seven years to walk around the lakes, but they do not give up. Both the text and the illustrations add sweet humor to this important story. Grand Canyon by Jason Chin. All of Chin’s books are spectacular and this book which investigates the geology of the Grand Canyon is no exception. The story follows a child and an adult on a walk through the magnificence of the Grand Canyon, detailing how the layers were formed, the plants and wildlife that live in the basin. There is so much information here that you and your children will want to read it over and over and then will immediately start planning your next vacation! Be sure to look for Jason Chin’s other books on the nonfiction shelf! Common Ground: The Water, Earth, and Air We Share by Molly Bang. The story of a village green acts as an allegory for the ongoing challenges of finding ways to share our communal space. Straightforward, simple text describes how a village uses the commons to graze their sheep but issues begin to arise when some people use more resources than others. As the story continues, Bang shows people using more and more of the resources, driving home the message that we must learn to share and use Earth’s gifts wisely. If Sharks Disappeared by Lily Williams. I love the illustrations in the book which uses the shark to share the timely message that all creatures are dependent on each other. Williams begins by pointing out the sharks have roamed the oceans and been an integral part of the environment for 450 million years. She focuses on their current state of peril due to overfishing and pollution, encouraging the reader to reflect on the need to value all creatures and be good stewards of the seas. Creekfinding: A True Story by Jacqueline Briggs Martin . 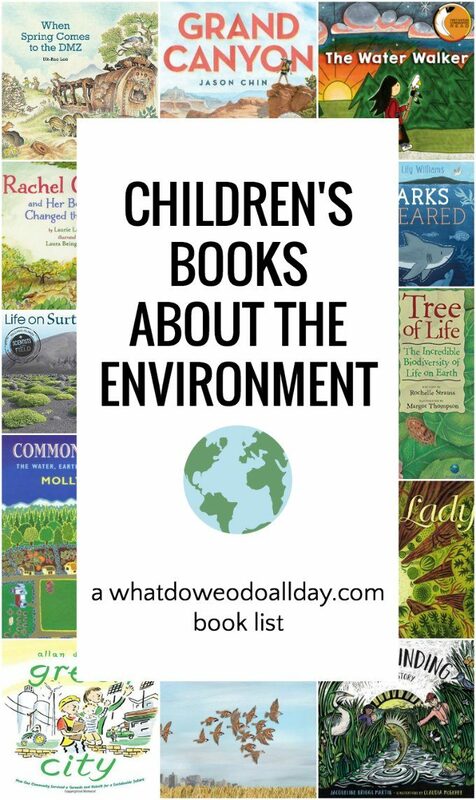 Not only is it imperative to read books that teach how ecosystems work, but stories of environmental restoration will inspire your children not to give up in the face of environmental setbacks, and disasters. This is the true story of an Iowan who was determined to find and restore the creek that once flowed through his farmland. The tale shows that patience is necessary, but the rewards are great. Not to mention, the illustrations are stunning. Green City: How One Community Survived a Tornado and Rebuilt for a Sustainable Future. Author Allan Drummond has three books in his collection of stories about people who focus on building sustainable communities. In this selection, after a tornado destroys Greensburg, Kansas in 2007, the citizens rebuild with sustainability in mind. Be sure to read the companion books, Energy Island, about a community in Denmark that uses wind power, and Pedal Power about how Amsterdam came to be the bicycle capital of the world. All three are wonderfully positive tributes to the power of communities to enact change. Life on Surtsey: Iceland’s Upstart Island by Loree Griffin Burns is a title from the great Scientists in the Field series of science-focused books. It is a fascinating look at how life develops on new land (1963!) and is particularly useful for older kids. The Tree Lady: The True Story of How One Tree-Loving Woman Changed a City Forever by H. Joseph Hopkins . As a city dweller, I am particularly fond of tree huggers, especially those that see the value of trees and plant life in urban settings. Katherine Olivia Sessions was the first woman to graduate from the University of California with a degree in science. After moving to a nearly tree-less city in San Diego, she advocated and spearheaded a campaign that transformed the area to a lush green land. I hope Sessions’s story inspires other kids to make a difference in their community. This would be a great addition to my list of books to inspire kids to change the world. Rachel Carson and Her Book That Changed the World by Laurie Lawlor. Rachel Carson’s Silent Spring was a wake up call about the impact our use of chemicals has on the environment. This book looks at Carson’s life from the beginning through the publication of her ground breaking book. Mama Miti: Wangari Maathai and the Trees of Kenya by Donna Jo Napoli. Wangari Maathai was the first African woman to receive the Nobel Peace Prize. She was recognized for her work restoring trees to Kenya. The wonderful thing about Maathai’s story is that it involves the cooperation of an extended community of women and will make kids aware of the power of individuals to bring positive, long-lasting global change. As always, Kadir Nelson’s illustrations are stunning. You can find several other books about Wangari at your library, too. One Plastic Bag: Isatou Ceesay and the Recycling Women of the Gambia (based on a true story) by Miranda Paul will help you discuss how environmental and social justice are intrinsically linked. When Isatou noticed that plastic bags do not degrade like traditional baskets when discarded she comes up with a plan to return beauty to her home and help the economic situation of her neighbors. Together, the women crochet plastic strips into small purses to sell at the market. This book is a good lesson on how communities can take action on their own, as well as pursuing more widespread measures through legislation. The Triumphant Tale of the House Sparrow by Jan Thornhill. This is a fascinating look at a creature most of us have not thought twice about! Thornhill describes how the sparrow adapted and readapted to the environment as humans persisted in interfering with its habitat. The book not only revises our understanding of “the most despised bird in human history,” but offers up a tale with an important environmental message. This text heavy book is aimed at ages 8 and up.